Christopher Martens, an assistant professor of Kinesiology and Applied Physiology, is studying a naturally occurring dietary supplement, nicotinamide riboside (NR) — a novel form of vitamin B3 — and its efficacy for boosting nicotinamide adenine dinucleotide (NAD+). His work is being funded by a grant from the National Institute on Aging. "NAD+ is critically involved in just about every metabolic process in our cells," said Martens, who earned his doctorate from UD before completing post-doctoral training at the University of Colorado Boulder. "It's particularly important for generating adenosine triphosphate (ATP), which is the body's primary form of energy, but it also helps boost enzymes responsible for protecting our cells against stress and damage." As we age, NAD+ levels decline. This is thought to contribute to broad impairments in older adults' physiological function, including reductions in blood flow and cognitive abilities. The decline in NAD+ may play a role in the increased risk for chronic diseases. Restoring NAD+ back to a youthful level has been shown to reverse age-related declines in physiological function in mice, something that Martens' Neurovascular Aging Laboratory now hopes to translate into therapies for improving physiological function in humans. Martens first began studying the effects of NAD+ boosting compounds several years ago as a postdoctoral fellow at the University of Colorado Boulder. On March 29, he and his former postdoctoral mentor Doug Seals published a paper in the journal Nature Communications in which they demonstrated that chronic supplementation with NR (NIAGEN®) for six weeks boosts levels of NAD+ in the blood of middle-aged and older adults. They also published preliminary data suggesting that NR may lower blood pressure and aortic stiffness — two key risk factors for future development of cardiovascular disease. The study was conducted at the University of Colorado Boulder and included 24 lean and healthy men and women ages 55 to 79. No adverse effects were reported. "Although future work is needed to confirm our findings, our paper opens the door to larger studies of NAD+ boosting molecules for slowing/reversing some of the detrimental effects of cardiovascular aging," said Martens, who now works with UD's Center for Cardiovascular Health. Martens' paper is the first to demonstrate the effectiveness of NR alone for raising NAD+ in humans and potentially treating age-related cardiovascular dysfunction. Cardiovascular diseases are the No. 1 cause of death globally. However, the benefits of NAD+ may not be limited to improving cardiovascular health. Since joining the faculty at UD, Martens became interested in how cardiovascular risk factors such as high blood pressure and stiffening of the elastic arteries (i.e., the aorta and carotid arteries) relate to increased risk for mild cognitive disorder and dementia. "The elastic arteries act as a buffer between the large pressure waves exiting the heart and more sensitive organs such as the brain," Martens said. "This protection is lost with age as arteries stiffen, contributing to an increase in blood pressure and allowing damaging pressure waves to enter the brain, which may lead to cognitive impairment." 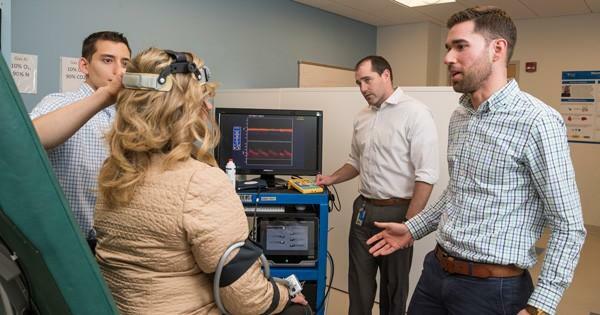 Martens' new grant seeks to study the blood pressure lowering effect of boosting NAD+ on brain blood flow and cognitive function in people with mild cognitive impairment (MCI) — a condition characterized by reduced memory abilities that often leads to the development of Alzheimer's disease. The UD research team plans to enroll the first subjects in June. Everybody normally loses some cognitive abilities with age, but some lose these much faster and dip into dementia (of which Alzheimer's disease is the most common form). MCI is the gray area between normal cognitive aging and dementia. "The person isn't demented, but cognitive function suffers," Martens said. "People with MCI still have the ability to perform the normal activities of daily living, but their cognitive abilities are lower than you would expect based on their age. And those who tend to lose memory over other domains of cognitive function are more likely to progress onto Alzheimer's-related dementia." For years, pharmaceutical companies have unsuccessfully tried to treat people who already have Alzheimer's disease. Martens said the answer to staving off the dreaded disease lies in earlier diagnosis and treatment, before the onset of dementia. Protecting the blood vessels by boosting NAD+ might be a promising place to start. The University of Colorado study was partially funded by ChromaDex, Inc., which holds patents for making NR under the trade name NIAGEN®. In the National Institute on Aging grant, ChromaDex is providing the pills, but not funding the study.